That's right, I'm back after a week in Nooooorsa! 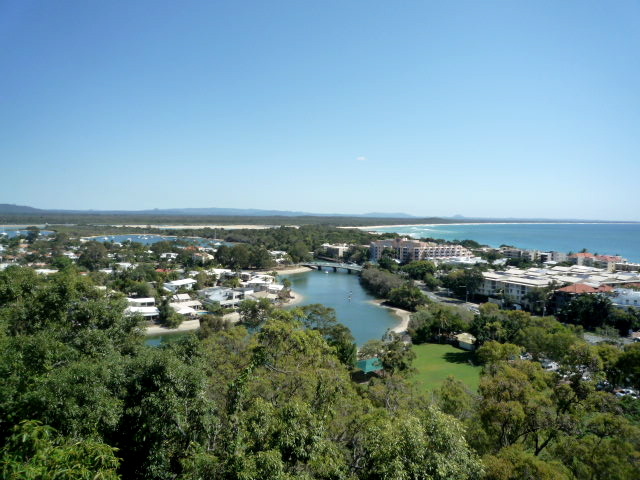 Jokes about Noosa being "Melbourne... in shorts" or "Far North Brighton" aside, I had an amazing amazing time up there. 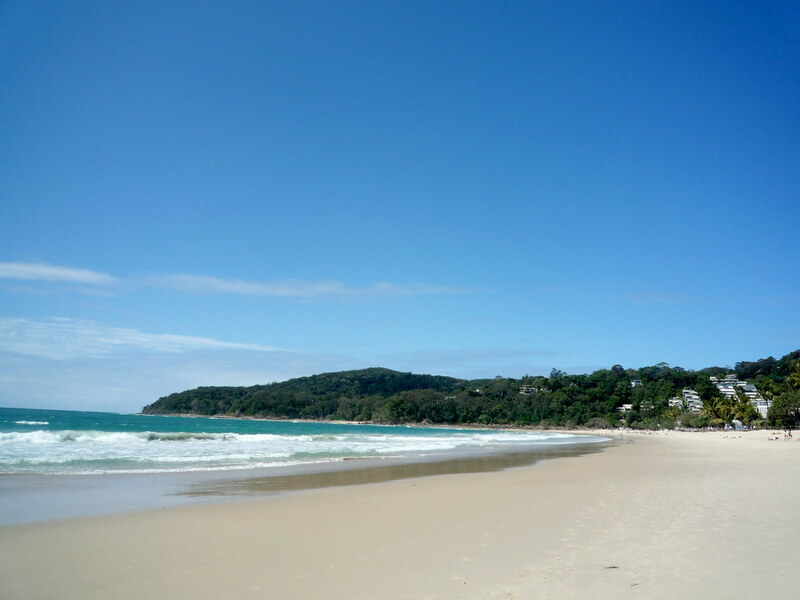 My favourite beach in the world, some choice restaurants, great weather, great company. Yes I know it wasn't too long ago since I got back from my NYC/SF gallivanting, but when it's late Melbourne winter and you're invited up to the Sunshine Coast for a family reunion, what else are you supposed to do other than gratefully accept?! My sister Birdie and I flew up last Sunday. 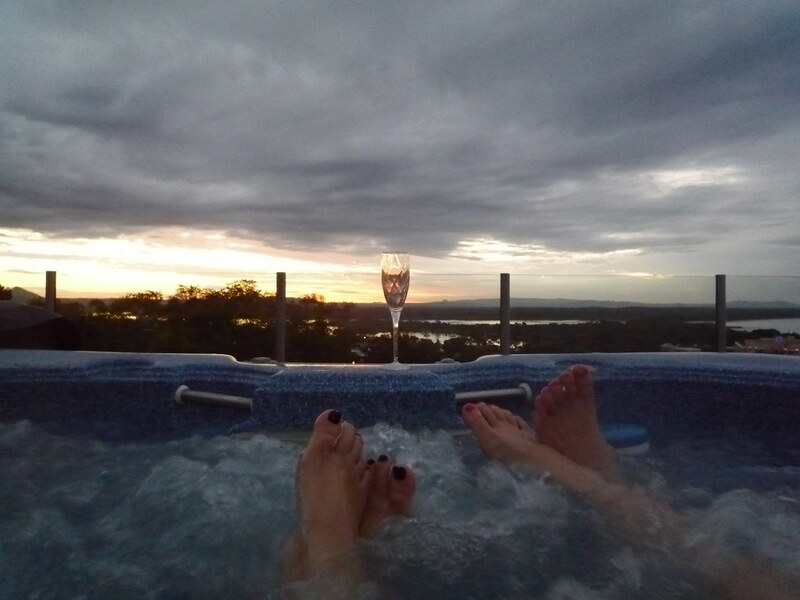 The other family members were all staying in a very luxuriously-appointed penthouse apartment up on the hill with INSANE views, but Bird and I were perfectly happy to slum it for two nights in the backpacker hostel. 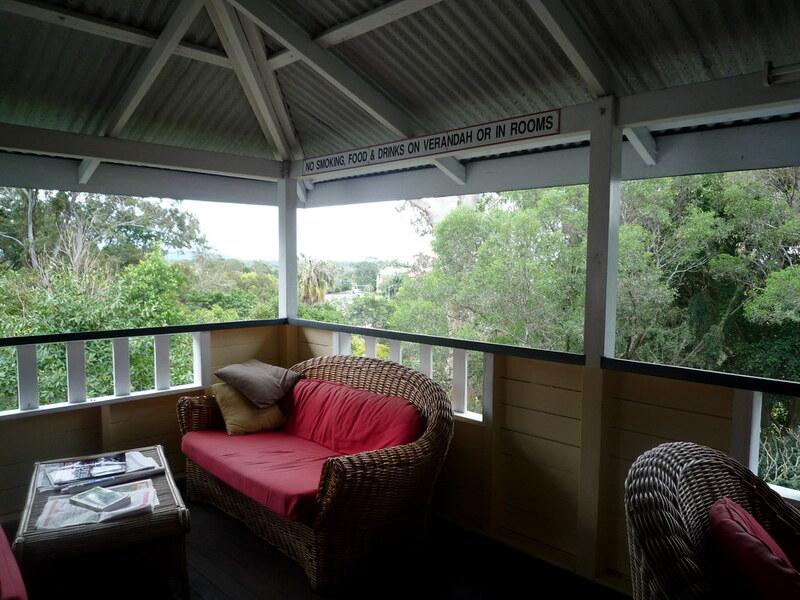 Halse Lodge is no ordinary backpacker hostel though: it's a beautifully restored 1880s National Trust-listed Queenslander mansion, just 100m from the main beach. We had a spotlessly clean twin share room which cost a mere $84 per night. I *highly* recommend it. Loved sitting out on this balcony reading my next book group novel. The balcony of the family apartment we moved into two days later - with panoramic views. 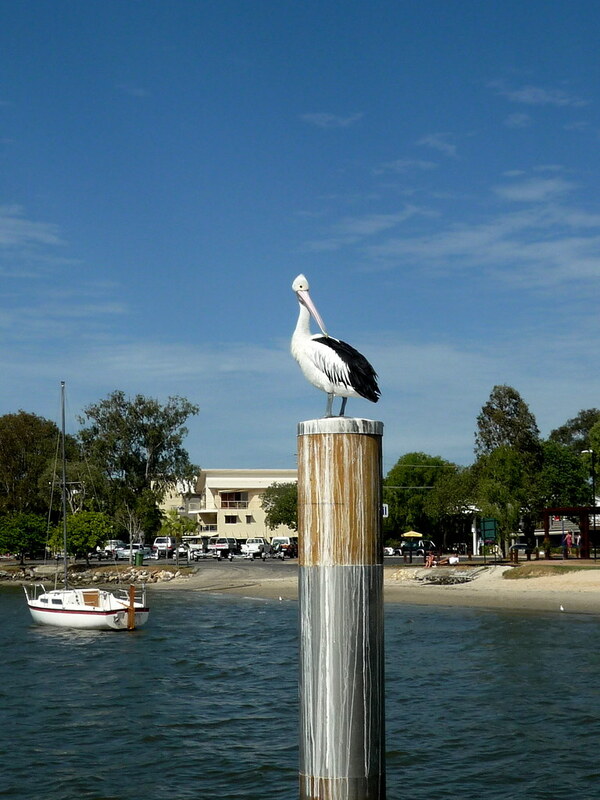 Pelican on the Noosa River. 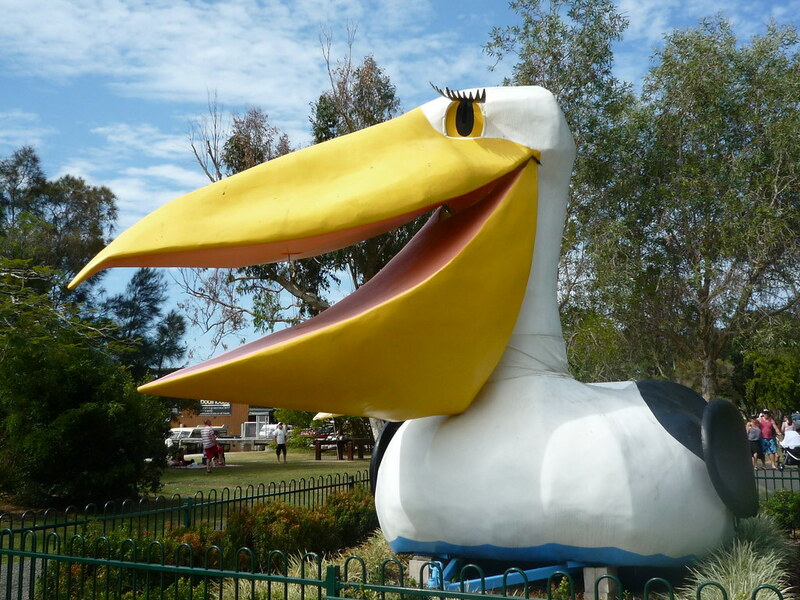 I think the Big Pelican in Noosaville is my favourite big thing in Australia. It's the absurdly long eyelashes that do it for me. According to the wonderful Big Things website, his beak holds more than his belly can (though this is yet to be independently verified). This chilli sand crab in a red coconut curry was the only highlight in an otherwise very disappointing meal at the Boat House, a floating restaurant on the Noosa River. Mostly ordinary, overpriced food, and inattentive service by a rude French waiter. I much preferred the other "Houses" (River House, Spirit House) we went to! On our third night up there a group of six of us went to dinner at River House. 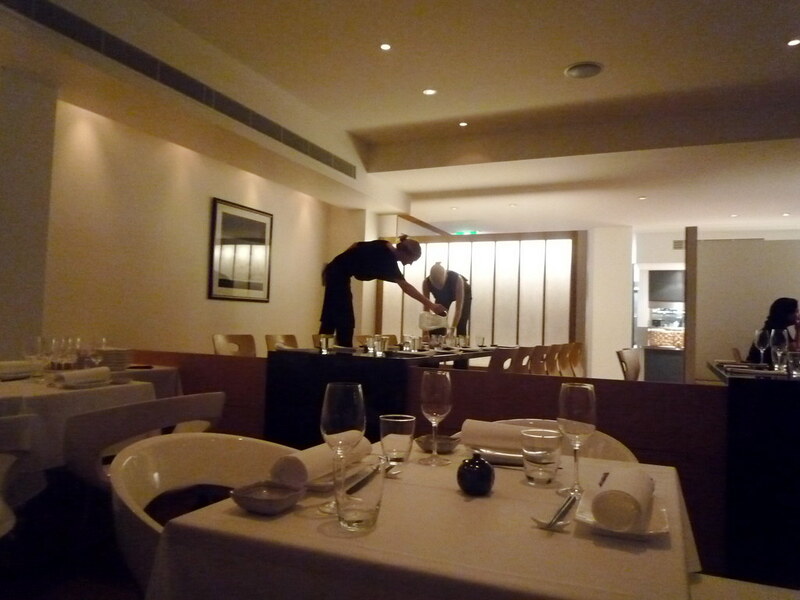 David Rayner, the chef/owner who first made it famous, is no longer there but we were very impressed with what new head chef Nathan Nichol is up to (also passionate about local and seasonal produce), and were charmed by the graceful interior and capable French waiter. 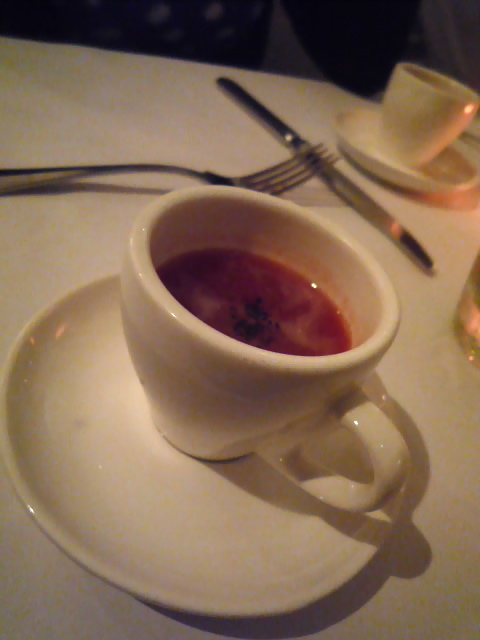 It was a liquid tomato sort of night: we were brought a complimentary appetiser of chilled (and chillied) tomato soup, and I also ordered a Bloody Mary (which came with cornichons and mustard apricots, a pleasant change from the typical celery shrubbery). 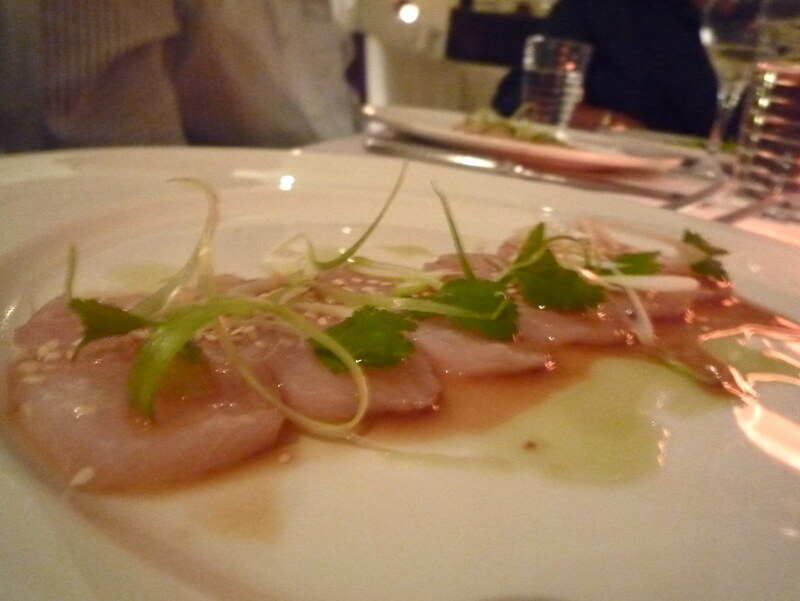 For entree, Birdie ordered the sashimi (premium kingfish sashimi, served with sweet ginger vinegar, bonito soy, lime, shallot, toasted sesame, coriander and wasabi oil, $18.50). 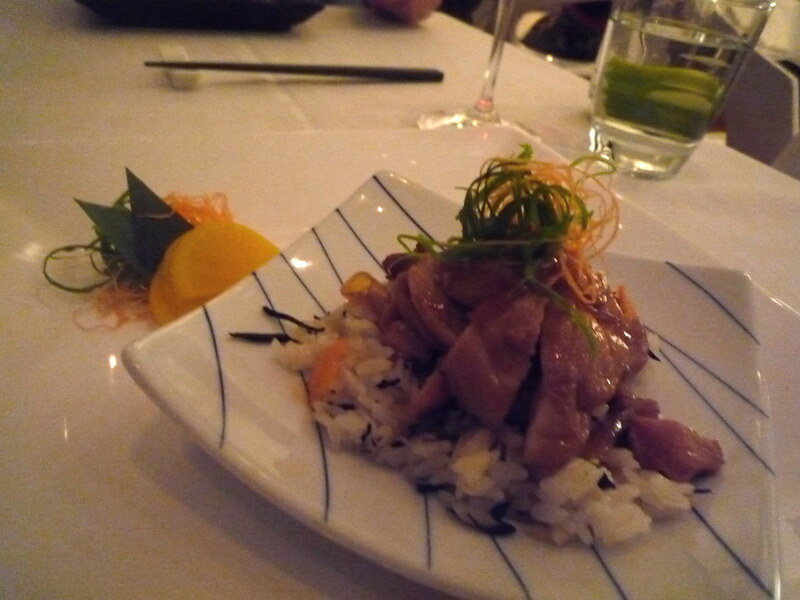 My little sister is self-avowedly NOT a foodie, so even she was surprised by how much she enjoyed it (I tasted it and loved the sweet ginger vinegar and freshness of the kingfish). 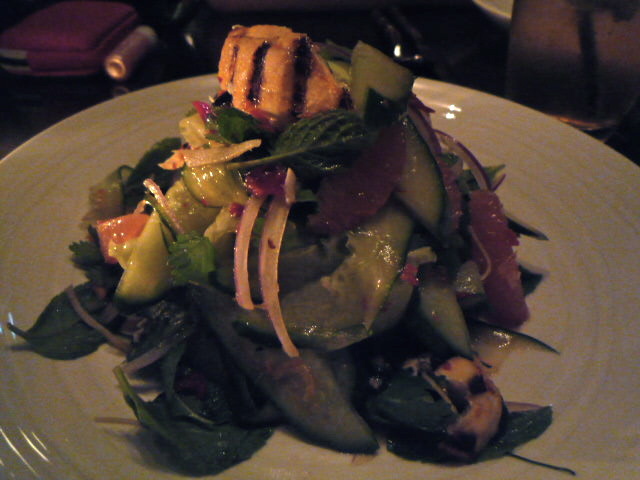 To quote Bird throughout the meal: "Ohmygod, I *actually* can't stop thinking about that sashimi I had for entree. I want to order it again for dessert!!" 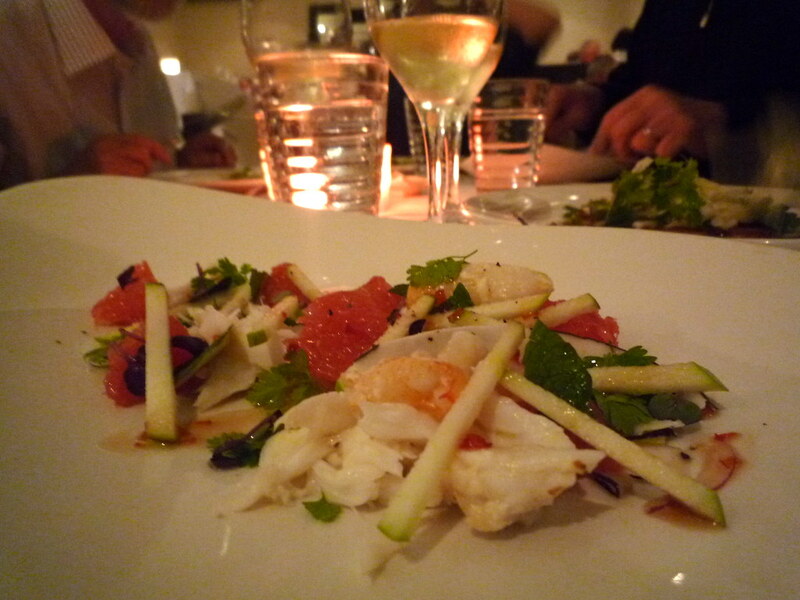 I had an equally sensational entree, the Noosa spanner crab, served with green apple, fresh shaved coconut, grapefruit, mint and sweet and sour dressing ($23). 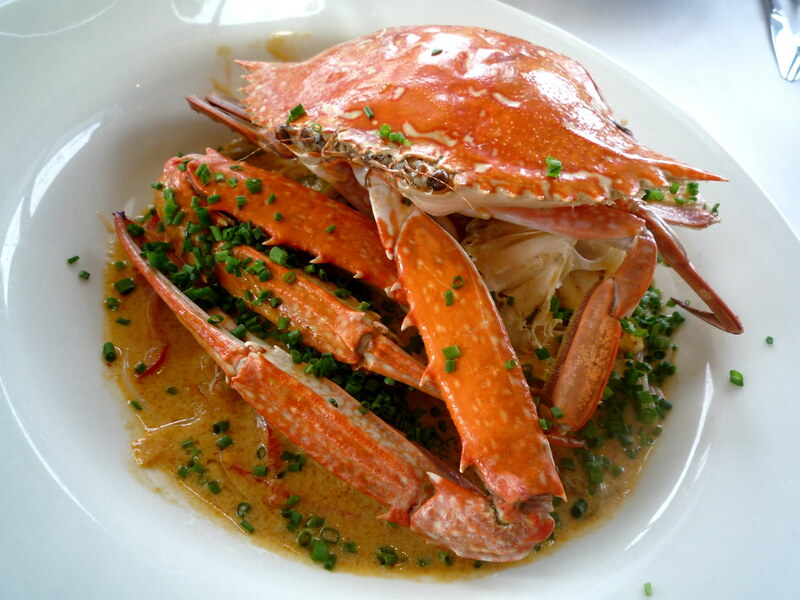 The spanner crab was hand picked that afternoon from the Noosa River, about 200 metres from the restaurant. Talk about locavore! Enjoyed the mains too. Bird and Uncle Rob had a great duck fat roasted duck leg each (not pictured). 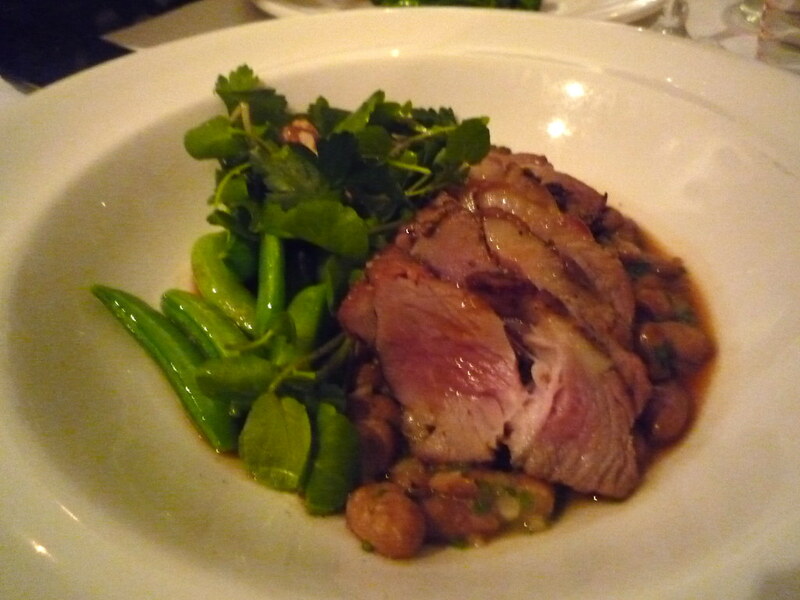 Dad ordered the chargrilled fennel crusted with borlotti bean ragù, sugar snaps, walnuts, watercress and fennel jus (pictured left). 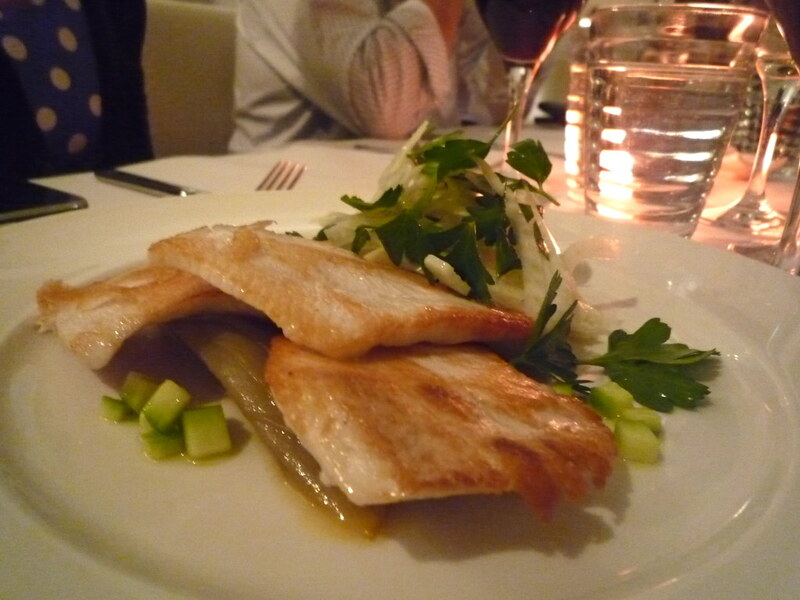 I had the pan seared kingfish on a braised witlof, orange, fennel and parsley salad with cucumber pickle and lemon vinaigrette (pictured right). All mains were $29.50. "I say! Moscato for everybody!" was the rallying cry when the dessert menus arrived. 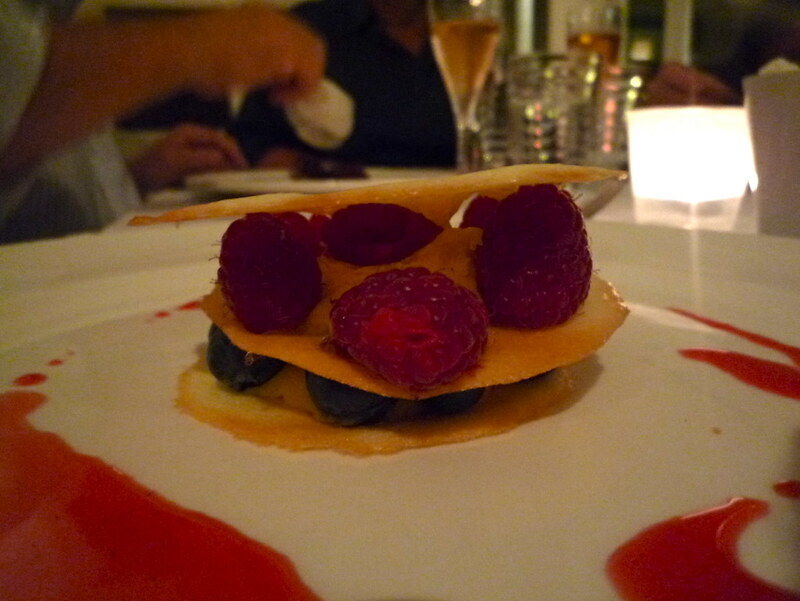 Birdie and Aunty Mees were devastated to learn there was no more sashimi left (for they'd decided they really did want to order it again for dessert), but Bird settled for the white chocolate mousse sandwiched into a tuille stack with blueberries and raspberries instead ($13.50). "It's okay... but it's no sashimi", she pouted. 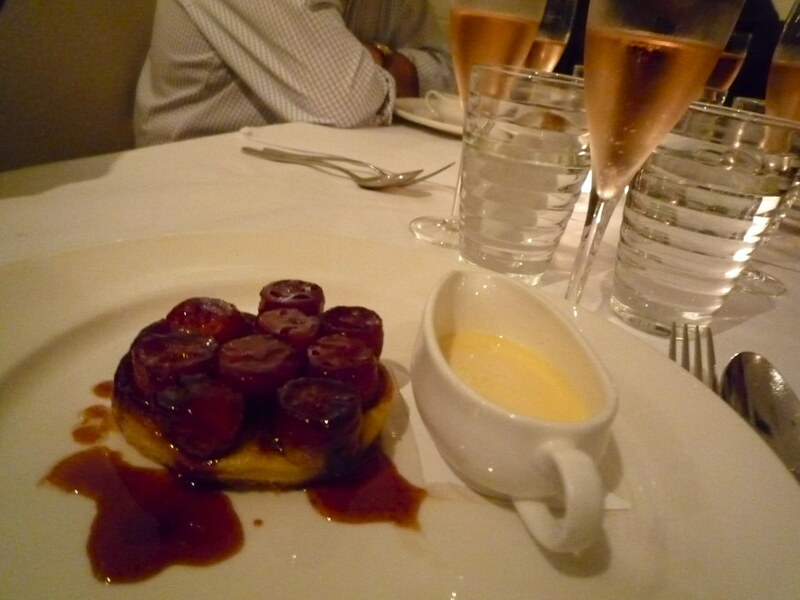 In contrast Robbie and I loved the caramel and banana tarte tatin, served with vanilla anglaise ($13.50). Sweet but not too sweet, good pastry too. 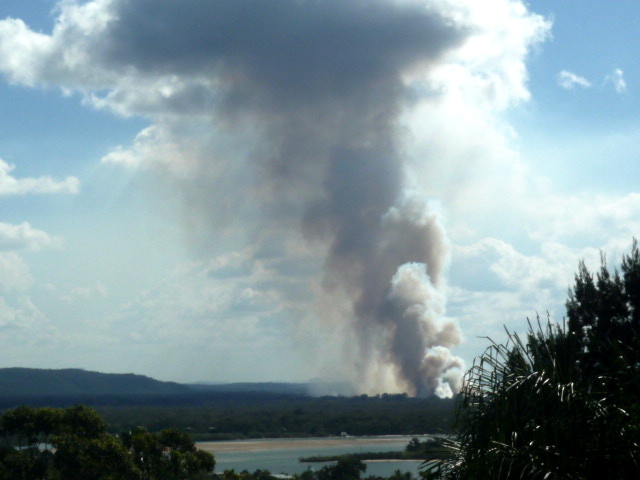 Dramatic back-burning glimpsed from our apartment balcony on the other side of the Noosa River. 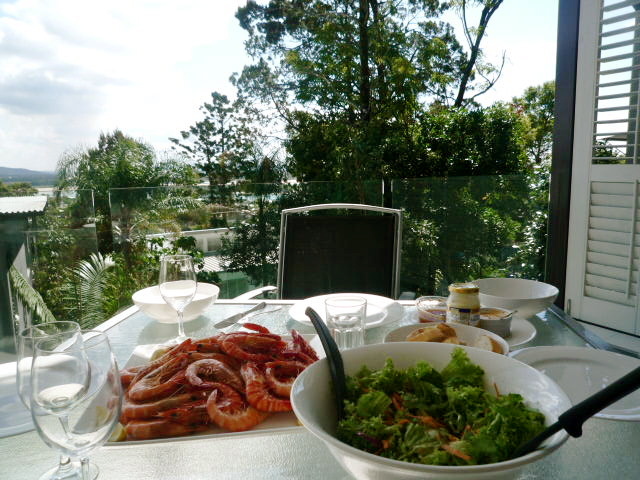 One of my favourite meals in any family holiday we have is the obligatory PRAWNGASM. I've written about prawngasms on the blog before: according to family tradition, a prawngasm involves of a gigantic bowl of cooked prawns served with dipping mayonnaise and/or sweet chilli mayo. 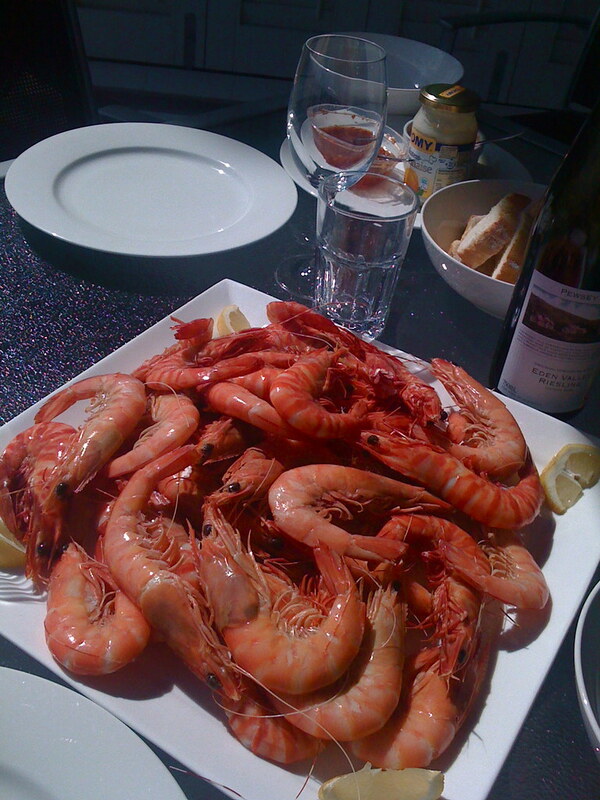 Other essential prawngasm accompaniments include: slices of crusty baguette, finger bowls with lemon slices floating in them, bowls for shells, a green salad, a crisp Riesling and an open air setting. A prawngasm can be a near-religious experience. It seems just about every food critic in Australia went gaga for Shinichi Maeda's Wasabi when they all got to swan around the Noosa Food and Wine Festival foodista junket in May (said with love and affection: I'm just jealous!). 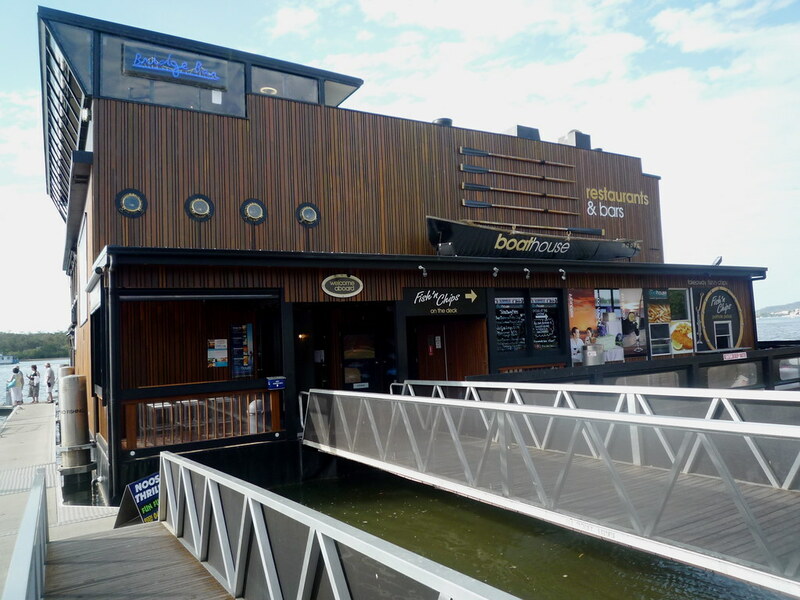 Previously located in nearby Sunshine Beach, Wasabi made the move to Noosa Sound only recently. It's unfortunate that there was a huge party of about thirty making the restaurant incredibly noisy on the night we went, but we still enjoyed the food a great deal. We had the $86 per person tasting menu. 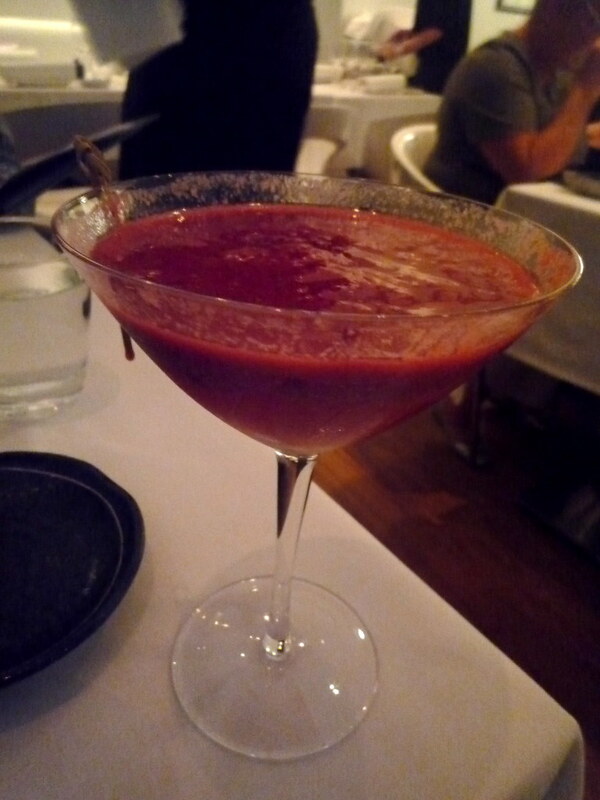 The girls started with cocktails: Bird had a Sakura, which involved raspberry and shiso sorbet, Hendricks gin and champagne. It was bubbling rather disconcertingly, looking like magma. 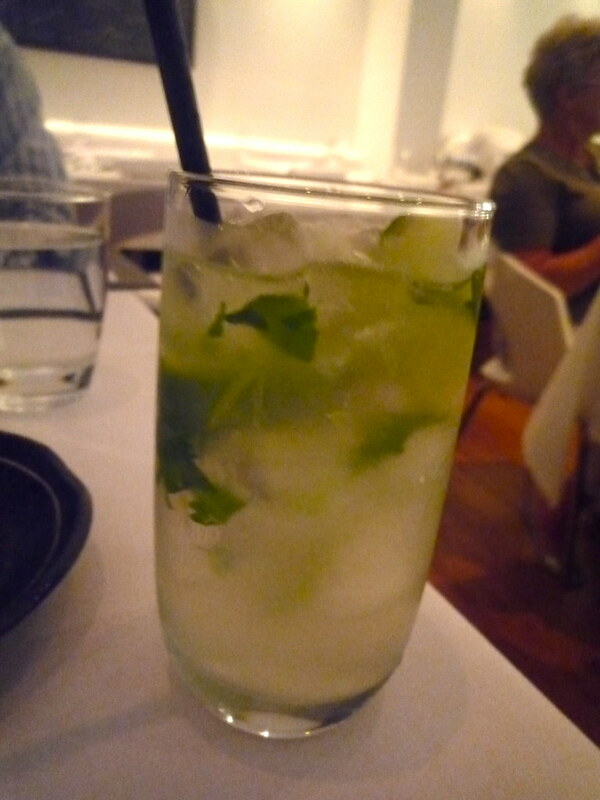 I had the safer Okinawa Mule, also fragranced with shiso leaf. After an initial bowl of crab-accented white miso, the kobachi (small bowl appetiser) course arrived. Muppet that I am, I was so busy admiring the dish and jotting down the ingredients that I forgot to take a photo! 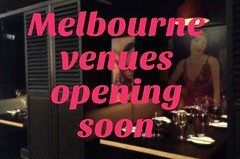 The same thing happened the week before at ezard, but at least then I had a hangover to blame. 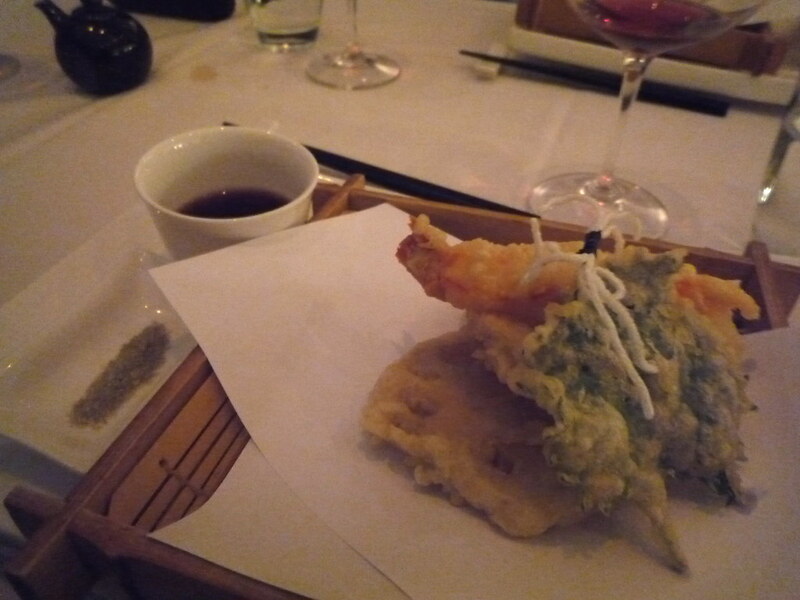 Luckily, Robbie had taken a photo of the course when the family had made the initial Wasabi visit, so I was saved! Many thanks to him for allowing me to use his photo below. 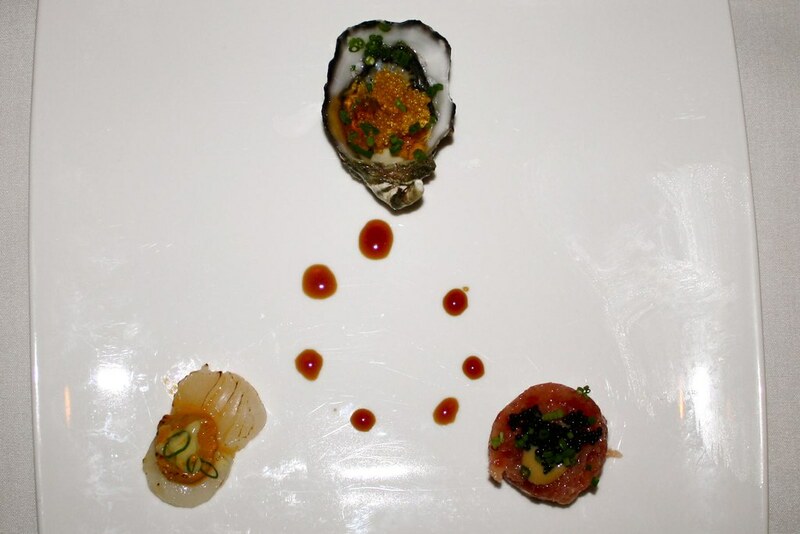 Clockwise from bottom left is the Uni (sea urchin) with Hervey Bay scallop and Japanese mayo; the Kumamoto oyster from Coffin Bay with katsu dashi jelly and tiny pearls of fish roe; and (my favourite) the fishy Yukke which in this case was Mooloolaba big eye tuna tartar with black flying fish roe, yuzu miso and kinome salt. 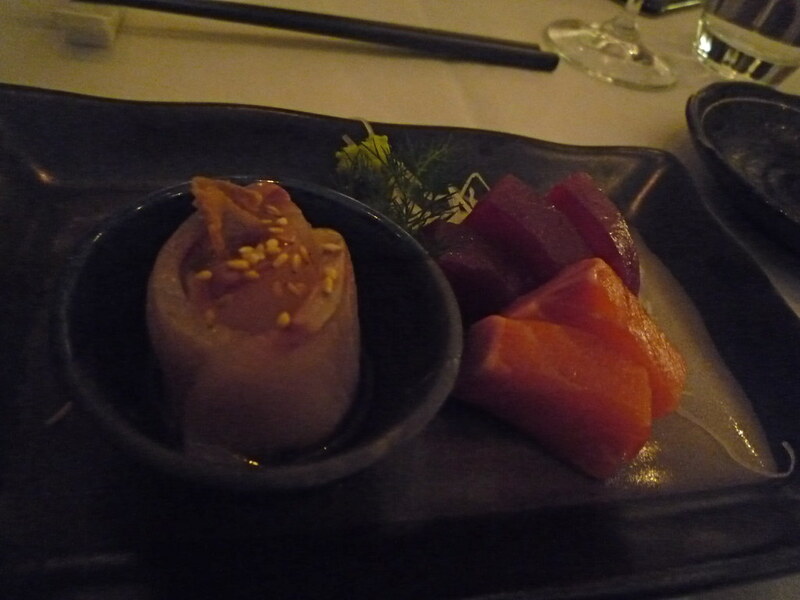 After the kobashi was the sashimi: Hiramasa kingfish (prepared in an interesting caramel, ginger chips, sesame and ponzu dressing), Mooloolaba tuna and Petuna ocean trout. Magnificent. These early courses were washed down with a bottle of the 2008 Henschke Little Hampton Pinot Gris, excellently chosen by Dad. We found the gyoza the only slight disappointment, but loved the seafood and vegetable tempura - especially the whole shiso leaf and the snapper with the dipping powder of sea salt and green tea maccha. 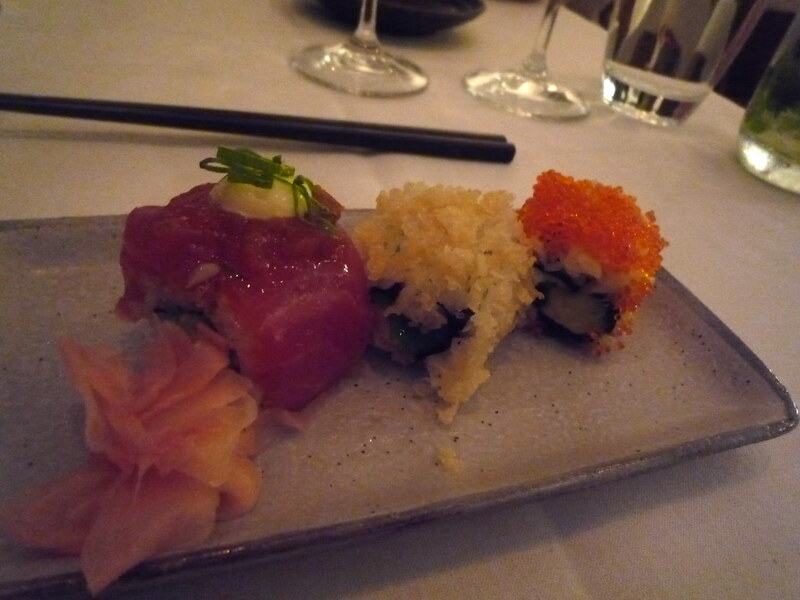 But going back to the raw fish for a moment, the maki course was another standout. Going from right to left for a change, we have three inside out rolls: the California roll, brushed with roe and containing blue swimmer crab, cucumber and avocado; the Kin Ebi, brushed with tasty tempura flakes and filled with tiger prawn, persimmon and coriander; and the slightly bizarre fusion (but DELICIOUS) Escondida, made of yellowfin tuna, avocado, salsa (! ), chilli and Japanese mayo. By this stage we were drinking the stunning 2007 Gembrook Hills Pinot Noir, but seeing as Dad was having red meat in the final course, he also ordered a glass of the 2006 Mountadam Shiraz Viognier. The rest of us ate the Tori Teriyaki, which was served with nama shitake on a bed of hijiki (black seaweed) rice. 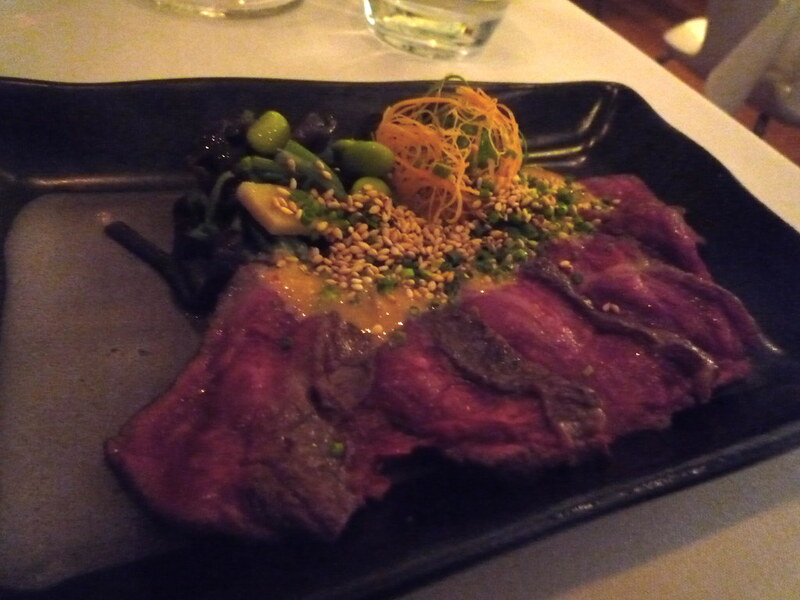 Adding on a $17 supplement, Dad had (and I tasted) the Aburi Wagyu: Mayura Station 500 day grain fed (score 7+) sirloin, seared and served with a sesame-dressed Japanese mountain vegetable salad. Neither Mum nor Bird enjoy the intense fattiness of wagyu, but Dad and I savoured it like the happy food wankers we are. 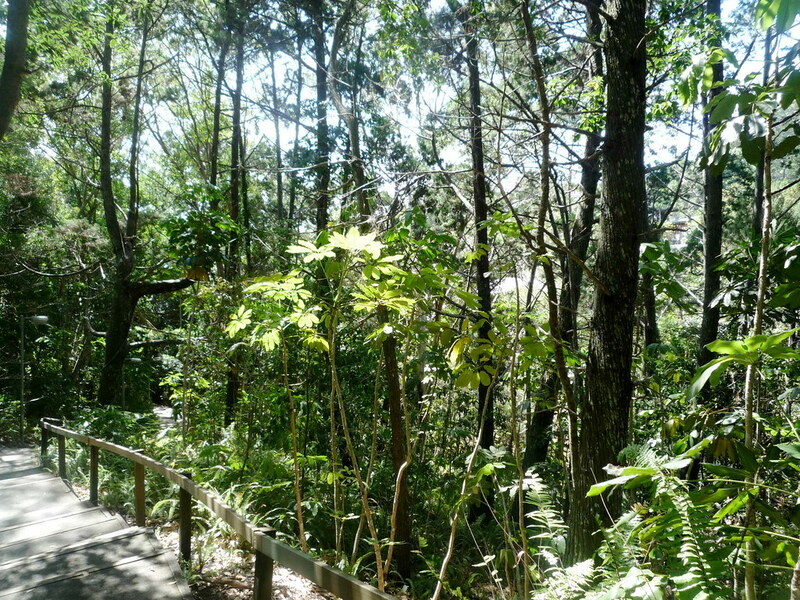 Gorgeous Noosa hinterland, walking along the back footpath down the hill. This photo is my new laptop wallpaper. 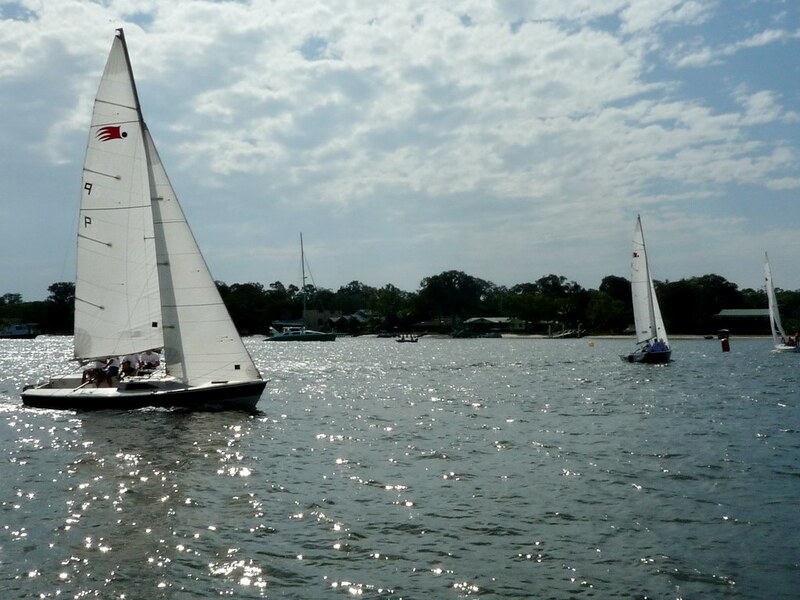 Rest assured that as well as all the wining and dining, we did other stuff like swim in the ocean every day, play Scrabble and the card game Up the River, Down the River, go on an excursion to the Eumundi market and pop in to the Noosa Jazz Festival, amongst other things. 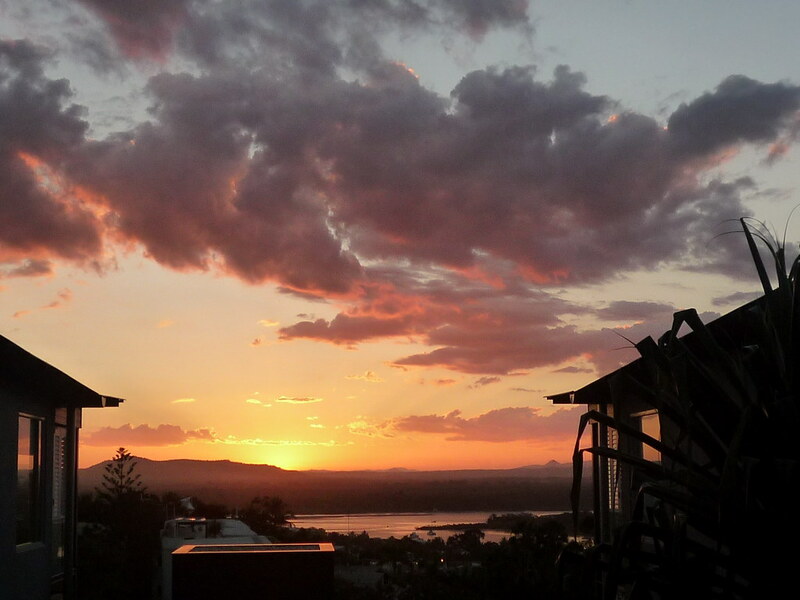 Our last Queensland sunset, and what a sunset it was! 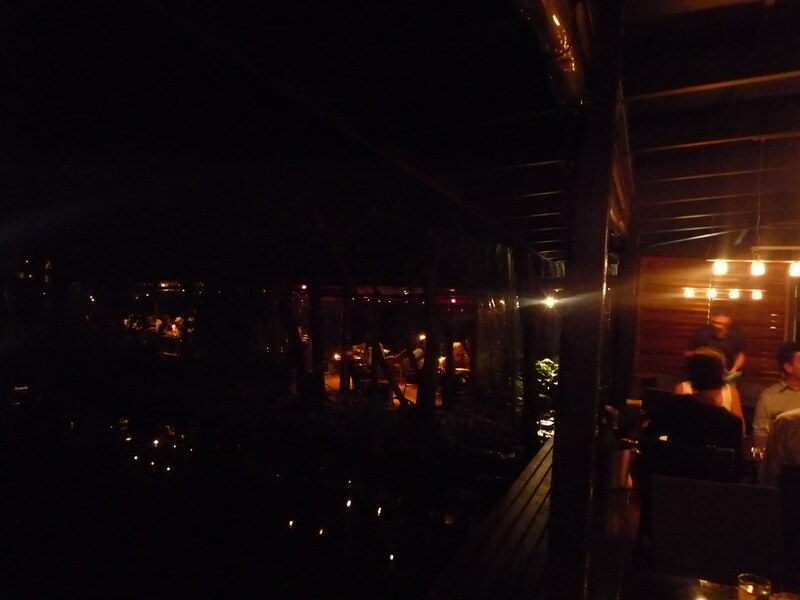 The restaurant I'd been most eagerly anticipating when I'd started planning my food week was Spirit House, in nearby Yandina. 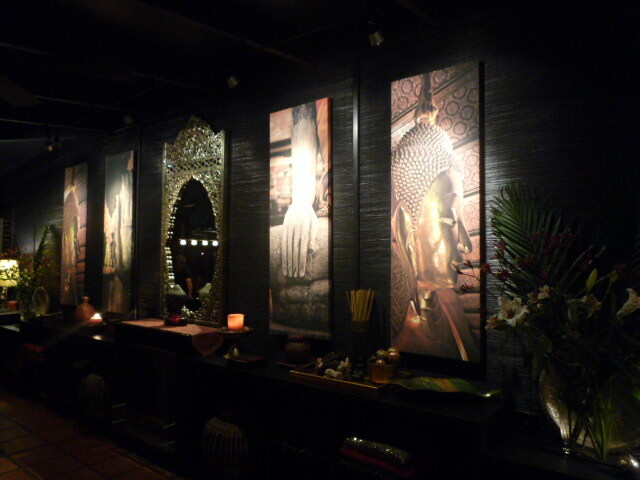 I went there several years ago for a romantic dinner with my then-boyfriend, and was completely enchanted with the setting and the Thai-inspired food. We made a booking for four of us (Mum, Dad, Bird and me) for the Saturday night. 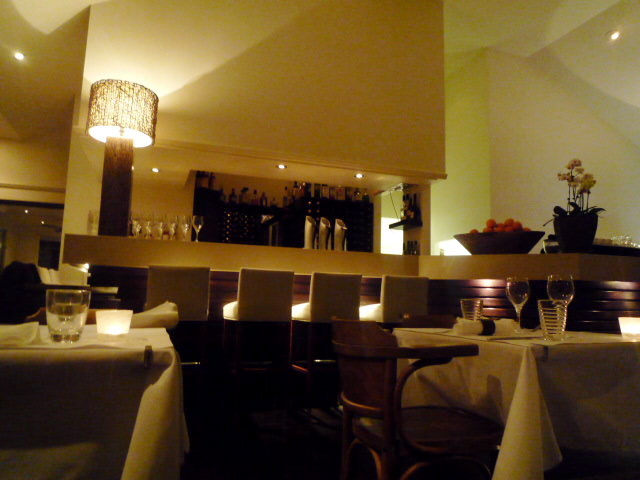 This has got to be one of my favourite restaurant settings in Australia. 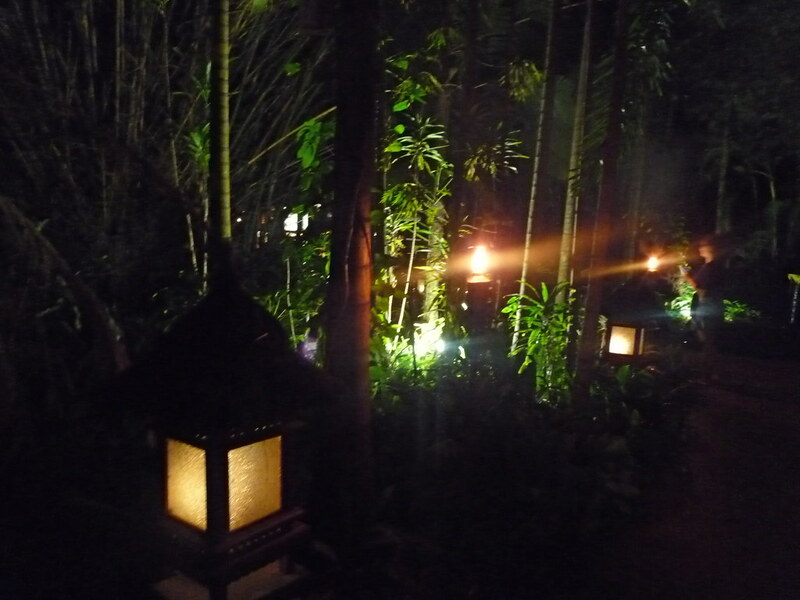 To reach the restaurant, you wander over a wooden bridge and down a path marked by dramatic flaming tiki torches through an amazing lush tropical jungle... but instead of being sacrificed to King Kong or the Smoke Monster (or worse, being voted off the island), you find yourself at the restaurant where all the tables are on open air verandahs looking out over a small tranquil lake. It's a little hard to see in the photos, but the lake is RIGHT THERE in the bottom left corner of the photo below. 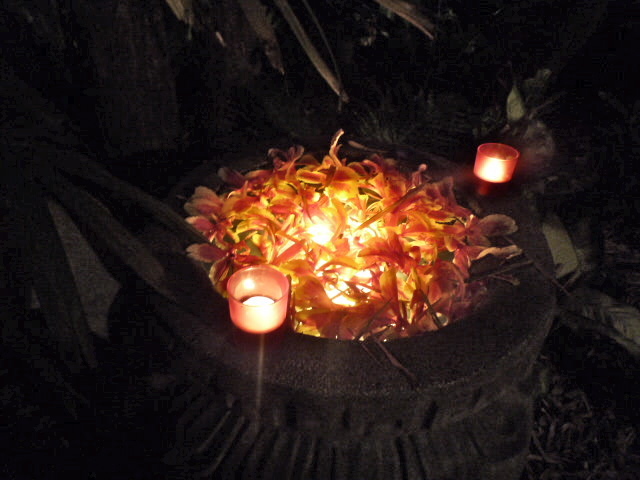 Frogs and other jungle creatures are chirping and the effect is magical. 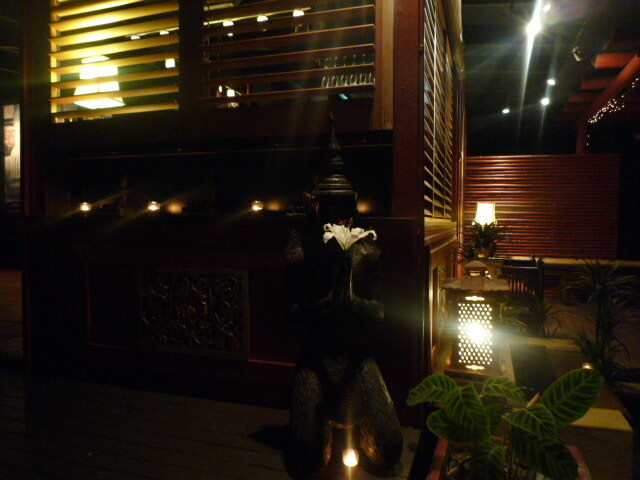 As well as running the restaurant, Spirit House produces a range of Thai food products (here in Melbourne, I've seen them at Leo's and at Macro Wholefoods) and runs Thai cooking courses - when we arrived at the restaurant we were KICKING ourselves that we hadn't thought to enrol ourselves in a class, we all would've loved it. The four of us ordered lots to share. Below is Mum's favourite dish, the chargrilled kingfish and pomelo salad with red chilli nam jim and Birdie's favourite, the ginger chilli caramel chicken and crispy noodle salad ($22 each). 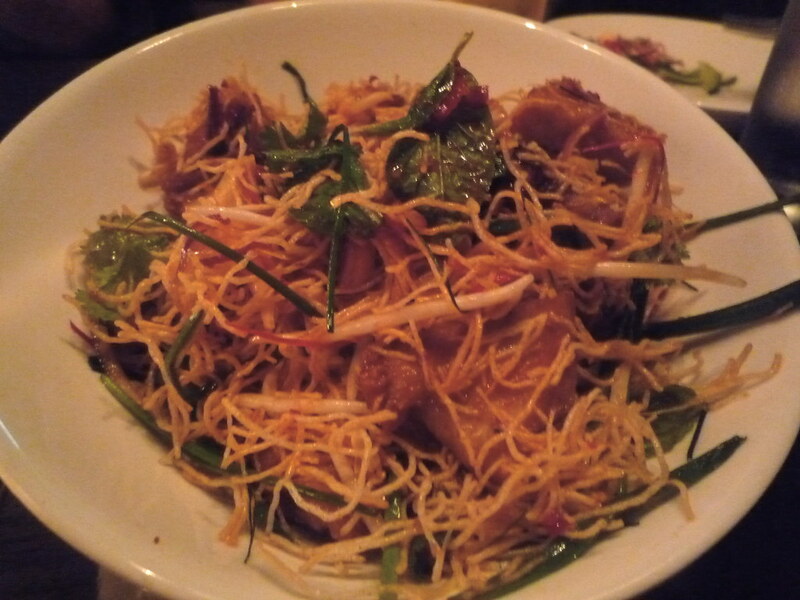 The crispy noodles had a great texture, ever so slightly soft rather than brittle. If I could change one thing I'd've added just a touch more chilli to both salads. We also had some crab balls and steamed shitake mushroom dumplings (not pictured). 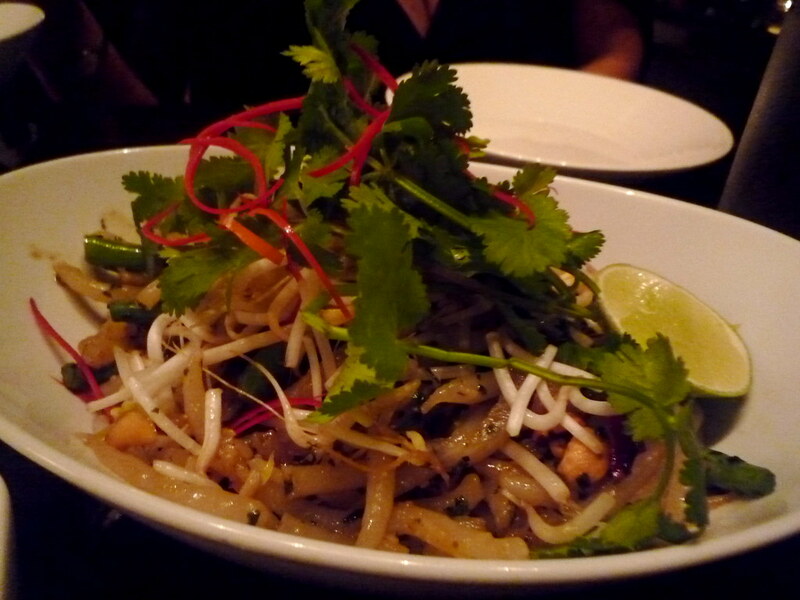 We all adored the stir fried tear drop noodles served with Asian vegetables, Thai basil and lime paste ($22). 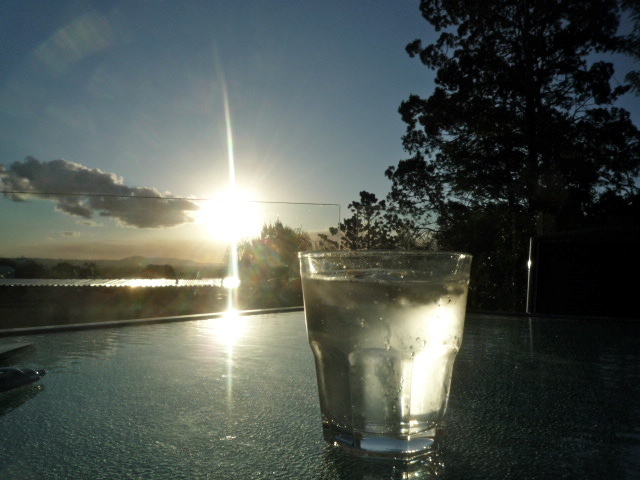 Refreshing, soft and the perfect antidote to some of the fiery mains. We thought the noodles bore an uncanny resemblance to casareccia-shaped pasta. 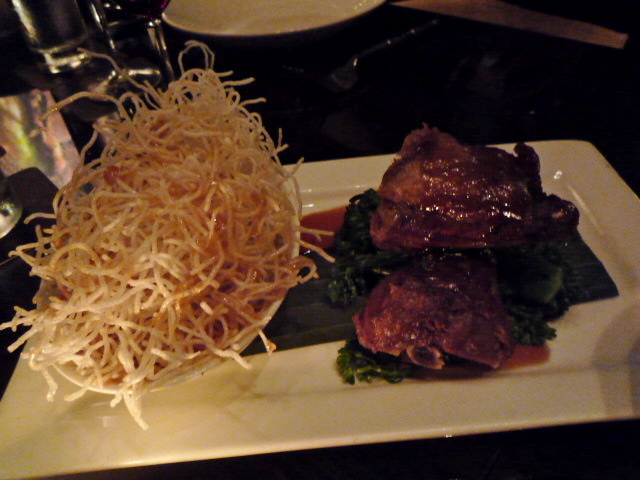 The other mains included the tamarind glazed duck with sweet and sour crispy noodles ($36) - Bird loved the glazed duck but hated the "gloopy" sweet and sour sauce on the noodles - and a hot jungle curry of pork with green pawpaw pickle ($32), which had plenty of peppery fire to it. 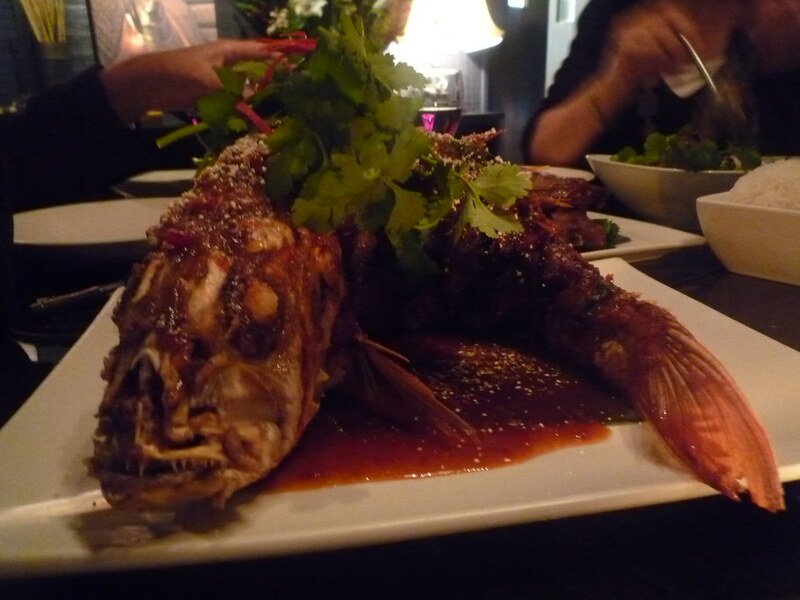 But the most spectacular dish of the night has to be the Spirit House signature, the whole crispy fish served with tamarind and chilli sauce (market price). The goldband snapper came out looking positively prehistoric! Dad and I agreed that this was our favourite dish, and had great fun carving it up. 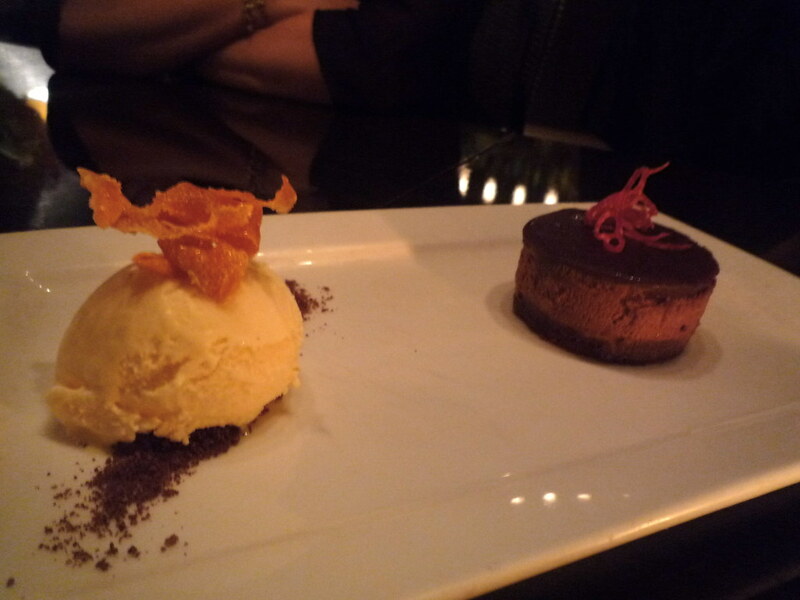 We decided to share a dessert four ways: the chocolate palm sugar caramel delice with blood orange ice cream ($14.50). I really liked the ice cream, as it was creamy and citrusy, but Bird thought it tasted a little too ripe. The rich delice was excellent. Overall the food was quite Gingerboyesque. I think our enjoyment of it was enhanced by the beautiful location. Well worth the twenty minute drive out of Nooorsa! Wow. Certainly have to rethink Noosa for food! You've made me positively homesick now... Thank small mercies I'll be back at the end of this month though unfortunatley staying at the decidedly less fashionable Coolum. 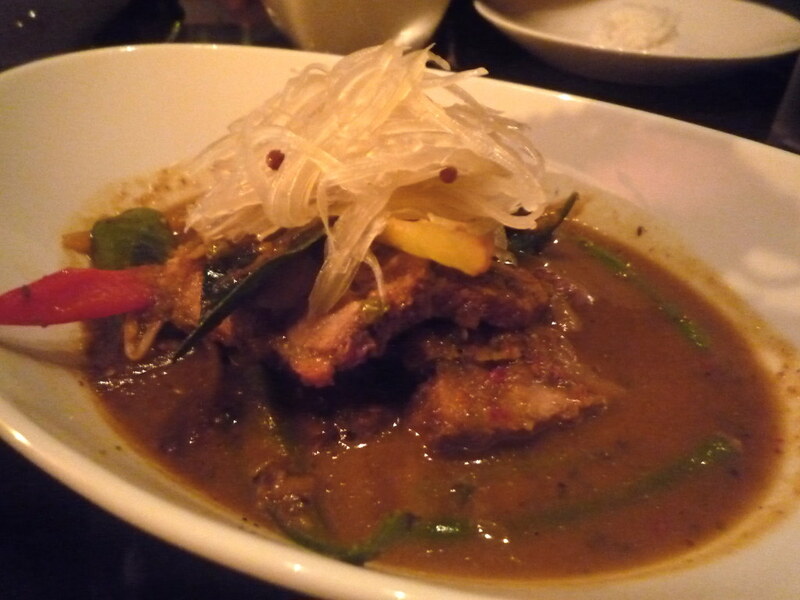 Hi Stephen: there's a lot of overpriced tourist rubbish on Hastings Street, but some gastronomic gems as well. Great post thanks. As a Sunshine Coast local (I used to live in Melbourne) I think your reviews were very accurate. 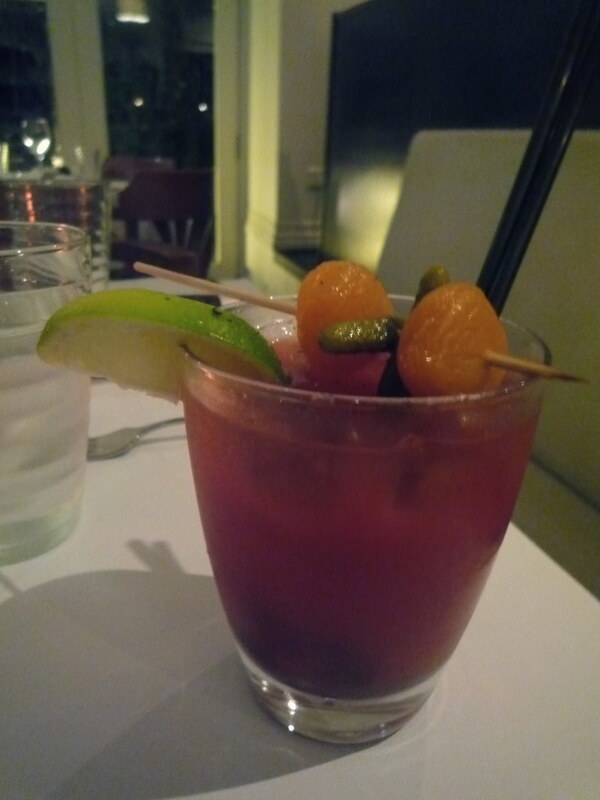 We went to Berardo's recently and thought it was very average. It is such a shame that many tourists don't try restaurants outside of the Hasting St strip like you did. 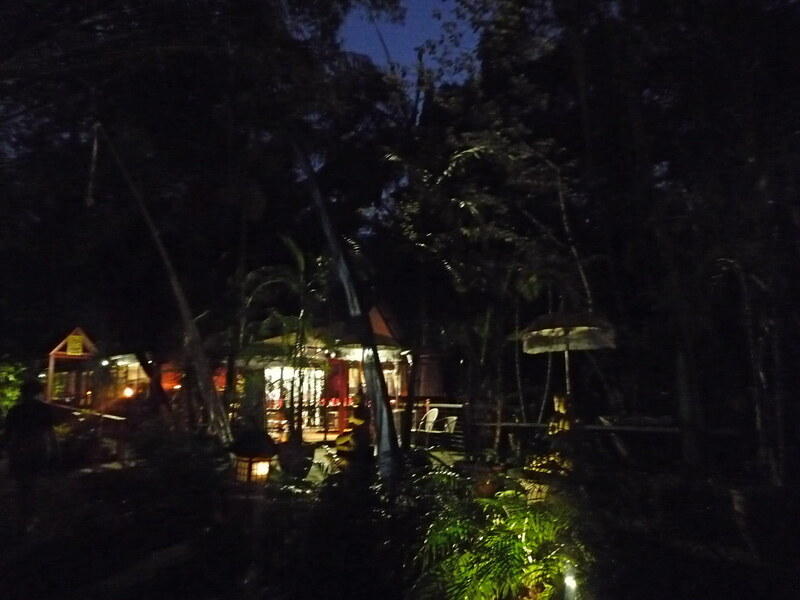 You just missed out on one of my favourite restaurants in Noosa that is a bit of a hidden gem/local hangout - Humid Restaurant on Weyba Rd (http://www.humid.com.au/). 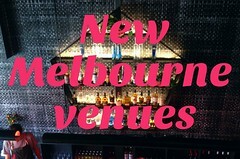 Also, for a nice casual lunch try Gusto in Noosaville (http://www.gustonoosa.com.au/). Hi Sally, thanks for your comment and tips. Humid was also highly recommended to me, but the only free night we had was Tuesday and they were closed! 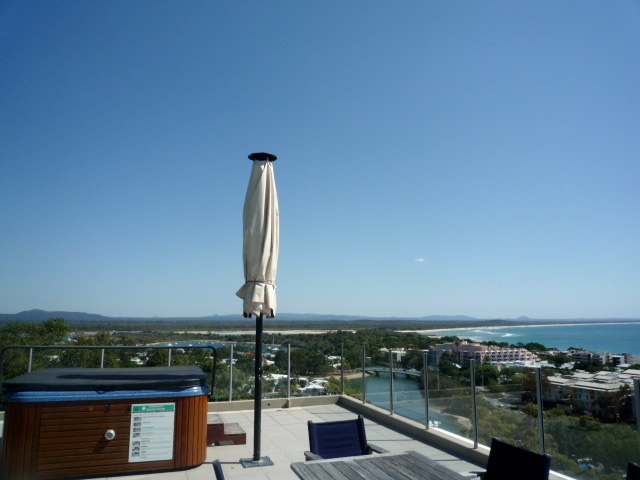 Next time I'm back in Noosa I'm keen to check it out.